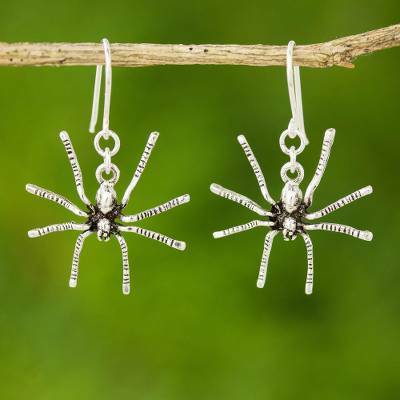 Sterling Silver Dangle Earrings, "Sterling Spiders"
Sterling spiders spin threads of modern elegance in a design by Wadarat Supasirisuk. The silver earrings are crafted by hand in Thailand. The spiders are very detailed and very well constructed. They also will be great for next Halloween, since I missed this one with the spider earrings. It takes a couple of weeks to receive them, but definitely worth it. I will surely order more jewelry from NOVICA. "I believe that opportunities are everywhere, that is, for those who can anticipate and make the risky decision to invest time and money." "Sawadee kha! My name is Wadarat Supasirisuk and I was born in the southern province of Nakorn Sri Thamarat. I am married and we have two children. After graduating from university, I had the opportunity to work in a company that manufactured jewelry. I chose that company because not only did the products interest me, but also because I could tell there was a growing demand for Thai jewelry. "I began to save my earnings and eventually opened my own workshop. I believe that opportunities are everywhere, that is, for those who can anticipate and make the risky decision to invest time and money. "I purchased some materials and started marketing the products myself. When I was in Bangkok I became aware of the potential for silver jewelry. I looked at the northern region of Chiang Mai and decided to expand my scope of products. "Earrings, rings, necklaces, and bracelets – I design all these products myself, sometimes adapting patterns I see in magazines and catalogues, sometimes simply through asking clients and professionals about the current trends. However, most of the times my clients already have in mind what it is they want and just ask me to actually make it. "My products are nice and of good quality. I feel confident that, regardless where you are from, you will like them." I love these stud earrings. Intricate designs well crafted in sterling. These earrings are a real treasure for me, Wadarat Supasirisuk. They are so dainty, and coordinate well with several necklaces I have. I also like to wear them as my only piece of jewelry. I like what they represent. They are my new best friend.